The Territory of Kansas was an organized territory of the United States that existed from May 30, 1854, to January 29, 1861, when Kansas was admitted into the Union as the 34th U.S. state. 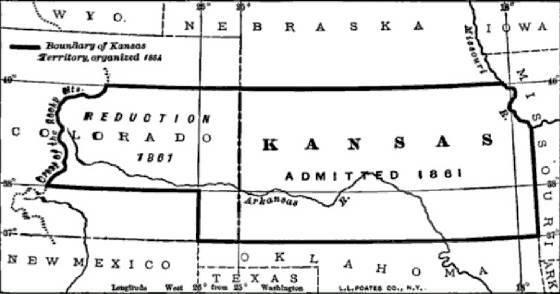 Upon the passage of the Kansas-Nebraska Act on May 30, 1854, the borders of Kansas Territory were set from the Missouri border to the summit of the Rocky Mountain range; the southern boundary was the 37th parallel, the northern was the 40th parallel. North of the 40th parallel was Nebraska Territory. The territory extended from the Missouri border west to the summit of the Rocky Mountains and from the 37th parallel north to the 40th parallel north. Much of the eastern region of what is now the State of Colorado was part of Kansas Territory. The Colorado Territory, a.k.a. Territory of Colorado, was created to govern this western region of the former Kansas Territory on February 28, 1861. See also Kansas Civil War History.